Hi all, can you please help me? I want to convert in a mkv file only the video encoding from hevc (h265) to h264 without loosing all the audio tracks in AC3/DTS/... and subtitles. Convert H265 to H264 FFmpeg? An Easier Way Here! Step 1: Download a ffmpeg static build zip file here. Choose the right one according to your system type. For example, I'm running on Windows 7 (32-bit), thus I downloaded the Windows-32bit one. Step 3: Use FFmpeg to decode HEVC to H.264. Stay in the current window and input your HEVC video with command: ffmpeg -i input.mkv -x265-params crf=25 output.mp4 to convert HEVC/H.265 MKV Video to AVC/H.264 MP4 with FFmpeg. I imported a MKV HEVC video (rersolution:1920×1080px, video bitrate: 624.39 kbps, audio bitrate:106.43 kbps, duration: 1min, file size: 6.43MB). It takes me 1 min 23 sec to transcode this MKV HEVC video to MP4 H264. If you'd like to batch convert HEVC to H265 and set other paramters, you need type in a more complicated command on the command window, such as transcode H264 to H265 with ffmpeg or batch conversions. Now, take batch decode H265 to H264 MP4 as an example. This one is a little more complicated. This will perform conditional encoding depending if the input audio is AAC or not. If the input audio is AAC then the audio will be stream copied (re-muxed) as is and needless re-encoding is avoided. If the input audio is not AAC then it will be re-encoded to AAC. This example will output to a directory named h264vids. This example assumes your inputs are .mkv. If not, change the .mkv instance in the example to your input file type, or just use the greedy * by itself. See note above regarding -crf and -preset. You can pause the encoding with ctrl+z and resume with fg. Well, how do you think of this conversion with FFmpeg? I'm totally confused and disoriented anyhow. Though I did transcode H265 to H264 for free, it could be the least option if there are any other HEVC converters. Is there? Of course yes. You can also change H265 to H264 with Handbrake, it's slow tho. 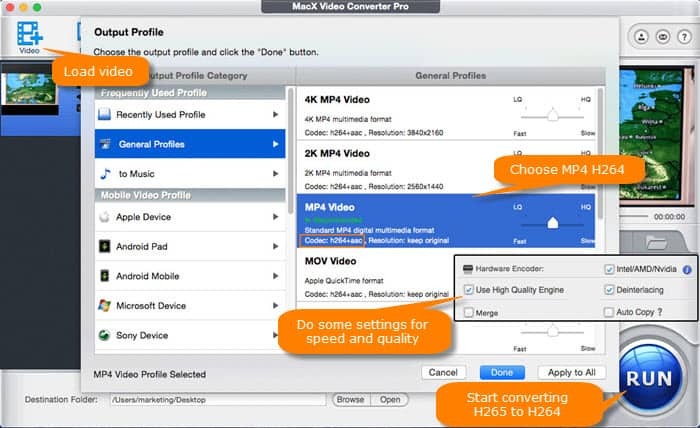 But to tackle HEVC/H.265 to H.264 conversion with easier steps and fast speed, MacX Video Converter Pro is highly recommended FFmpeg alternative with a great many bells and whistles on wide output profiles, fast conversion speed, high quality, and easy-to-use interface. Transcode HEVC x265 video H.264 with original quality for editing on iMovie, uploading to YouTube, Facebook, Vimeo etc., and playback on Mac/Windows, QuickTime, iPhone X, iPhone 8/Plus/7/6s/6/Plus, iPad Pro, Galaxy Note 8, Xbox One, PS4, Microsoft device and more. With 320+ video and 50+ audio codecs built in, it converts SD/HD/2K/4K video among 180+ formats on Mac and Windows, such as 4K H.264 to 4K H.265, HEVC to MP4, VP8 to VP9, MOV to MP4, MKV to MP4, WMV to MOV, MKV to MP4, AVI to MOV etc. No.1 fast speed to decode HEVC to H.264, thanks to the integration of multi-core CPU utility, Hyper-threading tech, Intel QSV hardware acceleration. And if you just attempt to convert MKV 4K HEVC to MP4 4K HEVC, you also also take advantage of Auto Copy mode, which will improve your speed up to 10 times than normal mode. Compared to FFmpeg, it has never been easier to transcode HEVC to H264. It owns a concise and clean interface with drag and drop features as well. You won't get lost in many options. Just load your video, choose output format and RUN, all done! The initial step comes to free download the HEVC to H.264 video processing software. It's compatible with Windows 10/8/7/XP and Mac OS X 10.5 or above. Step 1: Load HEVC/H265 files. Fire the program up and click on + Video to load your HEVC codec video. Or you can just drag and drop h265 files to this H265 video converter. Step 2: Choose H264 as output format. The HEVC decoder requires you to choose output format from dozens of ready-made profiles, all widely available models of iPhone iPad Android and general-purpose formats like MP4, MKV, FLV, AVI, M2TS, etc. Here I picked MP4 Video (H264), a more acceptable format compared with HEVC. Step 3: Do some settings for speed and quality. As you attempt to convert HEVC to H.264, you can check the box of Hardware Encoder to take advantage of the Intel QSV hardware acceleration, and tick up the box of the Use High Quality Engine and Deinterlacing to optimise the image quality though it may have some impact on speed. Step 4: Start transcoding HEVC/H265 to H264. Tap RUN icon, and your HEVC/H265 files will be encoded into H264 right now. A video conversion window will pop up to show you the copy processing, the FPS, time remaining, etc. MacX Video Converter Pro can easily convert X265 to X264 video and vice versa at a speed higher than FFmpeg. It also supports up to 370 audio/video codecs, including HEVC H.265, H.264, VP9, AVI, QuickTime MOV, FLV, MP4, MKV, DivX, etc. and makes them playable on iPhone, iPad, iTunes, Android devices, 4K UHD TVs, 4K video player, computer smoothly. Convert H265 to H264 with FFmpeg? An Easier Way Here!